Last Saturday I attended the opening meet at the University of Michigan’s new indoor facility. It is officially a part of the Stephen M. Ross Athletics South Competition and Performance Center. It is easily accessible to visitors, located just a half-mile off of I-94, but is a good three miles from the U of M campus (and 1.5 miles from the main athletics facilities such as Michigan Stadium and Crisler Arena). Fan turnout was very good. It was officially announced as 1,724. Spectator entry was free so the count must have been using just a clicker, but all spectators came in one entryway. Few if any would have left and re-entered since it was quite cold outside, the parking lot is about 80 yards away, and the facility has about everything you need: lots of restroom facilities, a permanent concession stand and fan shop, and even several TV screens. Later in the afternoon those garnered a lot of attention. The facility has a 200 meter banked track for competition and training, and also has a 300 meter flat track for training. The 200 meter track was unbanked and flat when I got there, allowing the 60 meter dash and 60 meter hurdles heats to be run on the homestretch and finish right in front of the grandstand. The backstretch can similarly be used for the 60s and there is a 60 meter straightaway on the infield, but that infield space was being used for high jump and shot put in order to make most efficient use of time. It only took three to five minutes to put inner and outer railings in place and bank the track. The finals for the dash and hurdles were in the middle of the meet and they laid the track flat again for those, then banked it again for the remaining multi-lap races. The first multi-lap races ever held on the track were invitational miles. Just one day after the birth of his second child, Nick Willis won the men’s race in 3:57.99, narrowly missing the indoor all-comers record for the state of Michigan. Canada’s Nicole Sifuentes won the women’s race in 4:27.69, by far the fastest ever run in the state of Michigan, indoors or out, and the Wolverines’ Erin Finn ran an NCAA-leading 4:40.17 in fourth. Yesterday's Wolverine Invitational elite men's mile was 🔥. 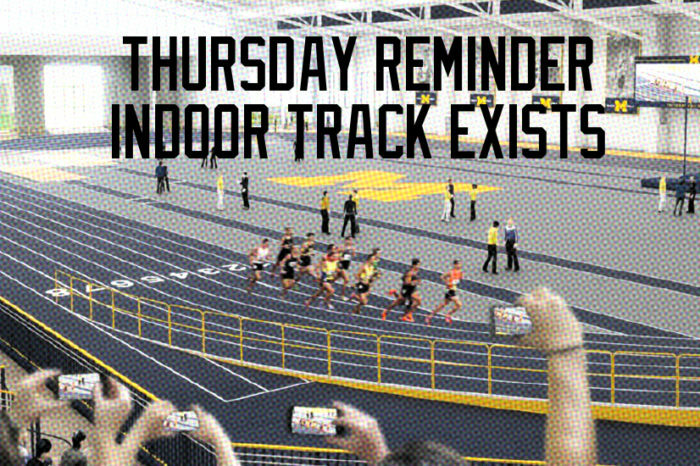 Where does that 300 meter track fit into the facility? The turns are on the outside of the 200 meter track and the 300 backstretch goes behind the 200 backstretch. On meet days that backstretch is curtained off and used as warmup space, with the “call room” are directly adjacent to it. The homestretch of the 300 meter track forms the first-floor concourse behind and underneath the main grandstand. Other touches are nice and well thought-out. A big video scoreboard on the backstretch wall showed live results for all field events on one half, and either live running event results on the other half (or reasonably entertaining video between running events). Acoustics are good; the building is a big metal box so the crowd noise slaps off the walls and could really get roaring for a big race, but the PA speakers are mounted in such a way as to be easily heard and without much if any reverb. I had two big questions: Can it host a major national championship, and will it? Kyle Terwilliger, Michigan’s assistant director of athletics communications for track and cross country, assures me that temporary seating for 1,500 can be put in place in addition to the permanent seating for 2,000. Seating for 5,000 is technically required to host the NCAAs, but that is regularly waived; Texas A&M doesn’t seat that many, nor other recent hosts such as Albuquerque or Birmingham or Boise State. Given that plus the overall excellence of the facility, it certainly appears that it can host an NCAA or USATF championship. Whether or not it actually will depends upon the interest of the relevant bodies, the University of Michigan for an NCAA championship and the Ann Arbor Sports Commission for USATF. The Wolverines are at home again this Saturday for a quadrangular against an accomplished opponent (Arkansas) and two hated rivals (Michigan State and Ohio State). Don’t miss it if you’re in the area.